After Won Jo, we decided it was time for dessert. 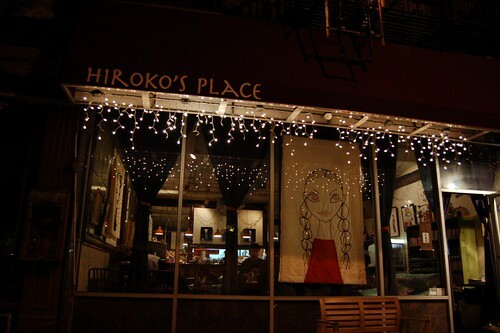 Somehow we ended up in Soho, and stumbled upon a cute little Japanese cafe. Their siphon technique of brewing coffee ultimately convinced me to enter. 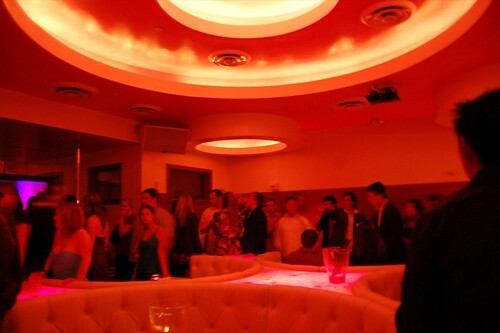 The ambiance was quite chill, with dim lighting, soothing green-tea colored couches, and a non-rushed (i.e. slow) waitstaff. The place also had a lot of personality, with quirky cartoon drawings of a girl adorning the walls. They even had bookshelf filled with (outdated) manga and live theater magazines in the corner. 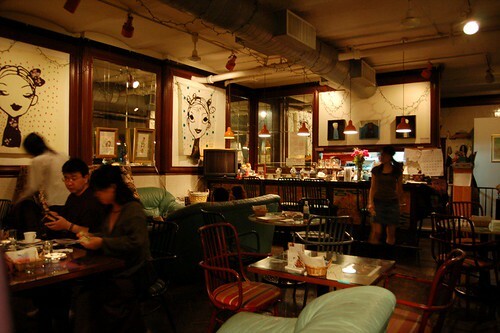 It reminded me of a Japanese Central Perk. Most of us got a variation of this. 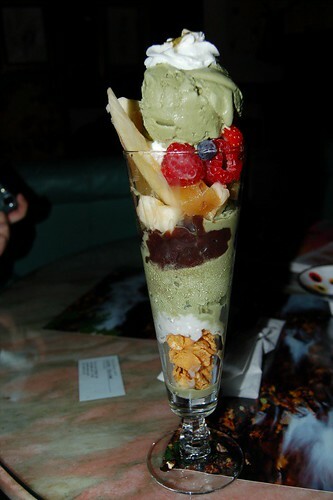 It consisted of a rich scoop of relatively bitter green tea ice cream atop fresh fruit (berries, pineapple, banana), atop red bean, more ice cream, and finally some corn flakes. It was good and not too heavy, and the best part was the corn flakes, which added a good crunch to the sweet mix. It was unfortunate that we weren't hungry enough for the savory entrees, which included curries, pastas, and omurice. I will be sure to check them out next time. After that we went to Boulevard, which was dandy. I'm going to be in Washington DC for a few days; have a nice Thanksgiving! 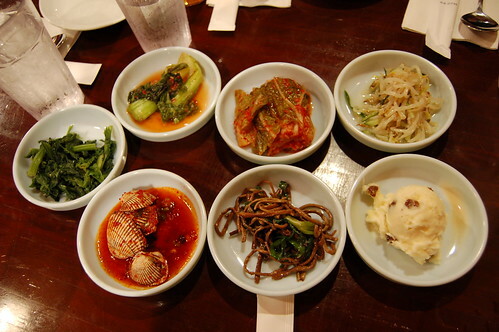 That night for dinner, we all headed over to Koreatown in search of some grub. 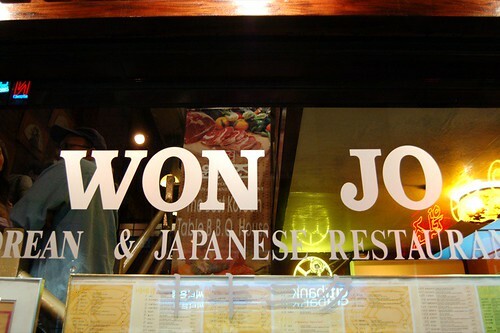 We didn't really know which restaurant was good, but then I saw a name that was a dyslexic attestation to my friend's winning abilities. 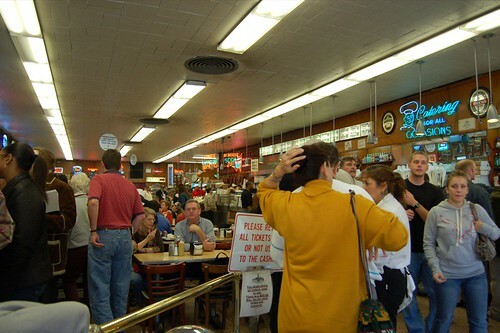 We proceeded to be seated immediately; about 5 minutes later, a line was out the door. Clockwise: kimchi mustard greens, lettuce kimchi, beansprouts, mashed potatoes with raisins, bean curd noodles, kimchi clams, steamed greens. The appetizers were very good (and probably the best part of the meal). Under the dim lighting, one of us mistook the mashed potatoes as chocolate chip ice cream. Tomfoolery ensued. The dumplings were quite large and plump, filled with some lean but hearty ground beef. 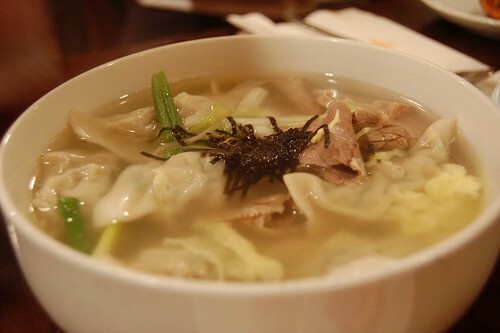 Flavorful but not salty, the dumplings and soup were great for the cold day. 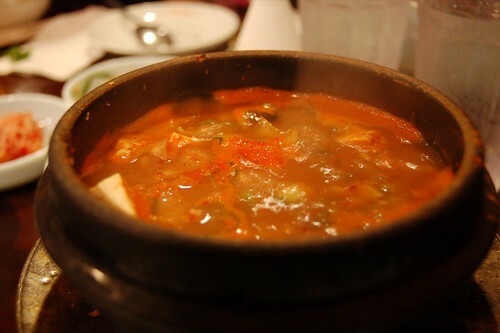 Flavor was a bit nondescript; it was basically a stone pot with vegetables in chili paste water. 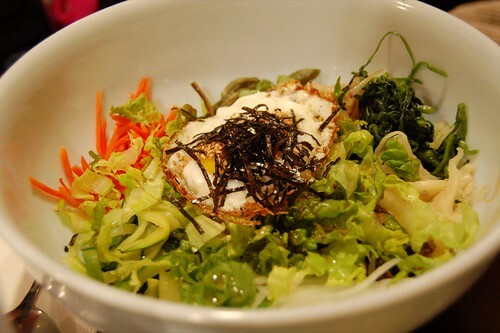 One of us ordered the classic bi bim bop, and said it was good. Overall, a decent but not spectacular meal. Won Jo is known for the good barbeque, but we didn't particularly want our suits to smell like hearty flamebroiled beefy goodness. After our quick lunch at Katz's, we decided it was due time for some sweets. 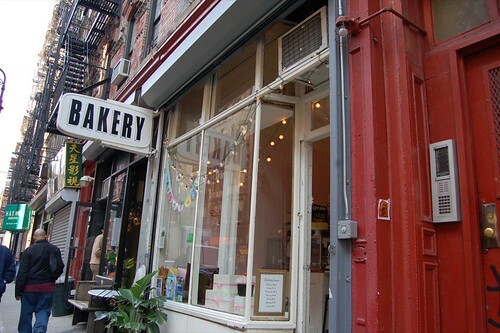 We headed a few blocks down and found ourselves in front of Babycakes and its big Bakery sign. It was as if its mere presence had beckoned for me to find it. 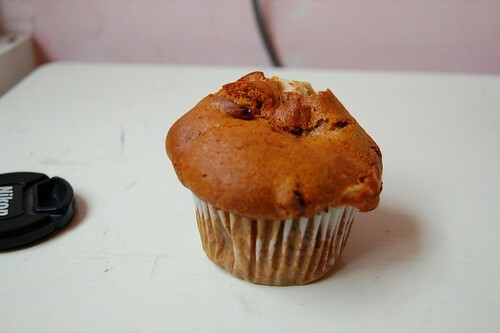 I decided to go with an apple muffin, because I had been craving one of their muffins since last spring. I was a bit disappointed to find it so mushy, since I was craving the chewy, slightly crusty texture of their blueberry muffins. I would have had ordered something else but at this time A called since she had arrived in the city. We headed up to Grand Central to pick her up, and I decided it was time I introduced her to the magnificent Lady M. I don't think there has been a time in the past two years that I've gone to the city without refueling with some crepe cake. I'm getting predictable. If there is one word to describe this place, it would be sterile. It was more sterile than I had remembered, because once we were seated, we were talking in hushed whispers and turning our phones to vibrate. 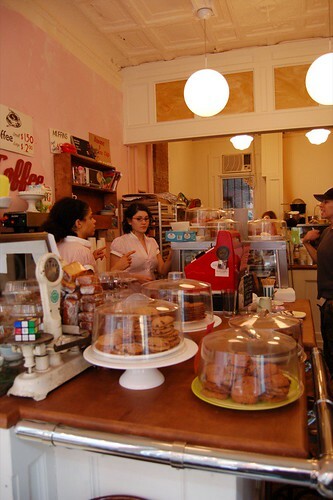 Visiting the two bakeries in the same day is a good way to juxtapose the neighborhoods in which they are situated. In any case, soon after I took this picture, the lady in the short hair snapped at me for taking pictures. Well, as you can see below, I didn't quite listen. 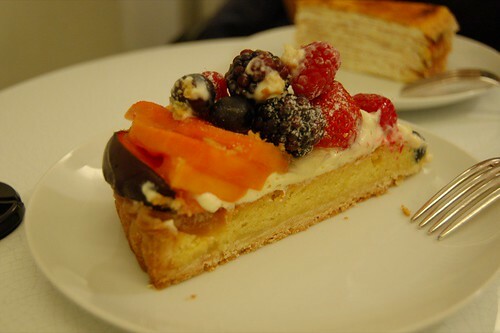 This was an excellent fruit tart. The fruits layered on top were fresh and juicy, and we were delighted to find some sliced papaya on there. The best part was the crust, which was an interesting contrast of textures. The outer and bottom crust was shortbread-dense and crumbly, while the layer on top was soft and cakey. Delicate and delicious. 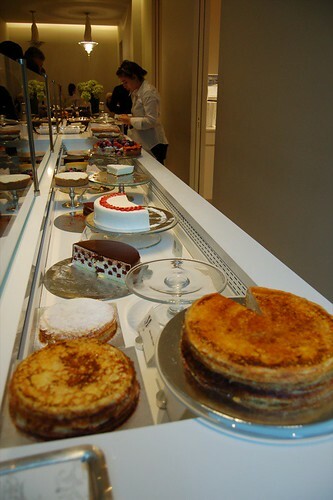 And of course, the mille-crepe cake. 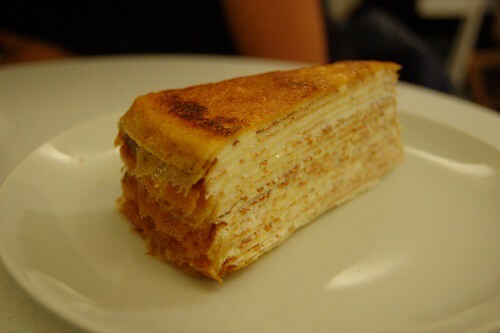 A enjoyed the ethereal layers and the smoky caramelized crepe on top. 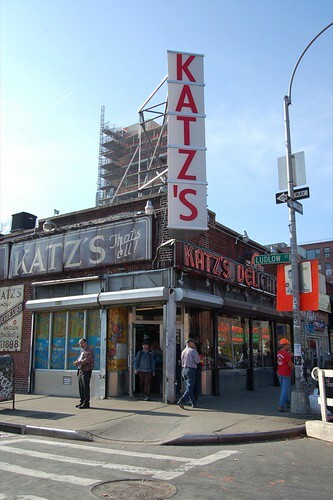 The next morning, a couple of us headed down to Kat'z Deli on the Lower East Side for some Jewish deli goodness. 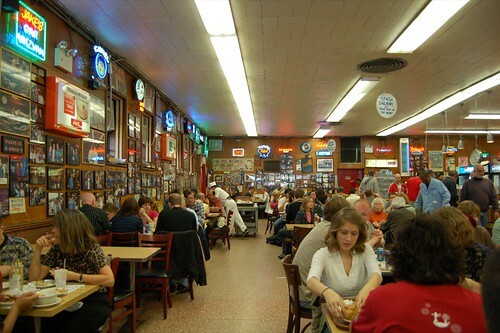 Opened in 1888, Katz's is a New York institution. It's also the site where "the famous scene" from When Harry Met Sally was filmed. One of the most overrated films in history, but I'll save that diatribe for another time. In line. You go in through a turnstile, and take a ticket. Be sure not to lose it, or you'll be $50 lighter in the wallet. Order your food and they'll write down the price on the ticket. You pay when you leave. One of the things I had to do on this trip was to try a knish. 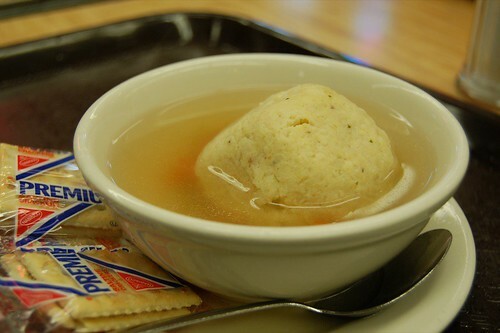 Now what is a knish you ask? 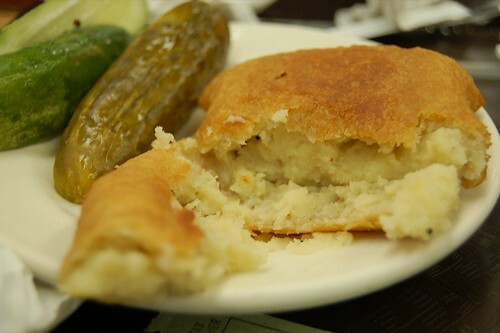 According to Wikipedia, a knish is an "Eastern European snack food popular in Jewish communities. A knish consists of a filling covered with dough that is either baked or fried." That said, the knish wasn't very good, but never having had one, I don't know if it was just this knish or knishes in general. The crust was too hard, the mashed potatoes too dense, and the filling needed more salt though it was seasoned too pungently with a peculiar spice. One of my friends ordered this, and she said it was good. Now for the main course. It's hard to tell from this picture, but this sandwich is HUGE. The amount of meat is overwhelming, and I had the hardest time keeping the slices from falling onto the plate. 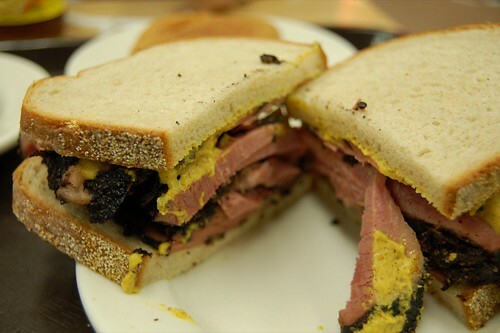 The pastrami was great - juicy, nicely flavored, and not too salty. I did take issue, however, with the meat to bread ratio. There was just way too much meat! I would have been quite pleased if I had 2 more slices of rye to go with it. The sandwich was good, but not mind-blowing. As some of you know, I've been having an insanely busy semester, with classes, interviews, and recruiting. So last weekend, I decided to bring some balance into my life with a trip to New York City. 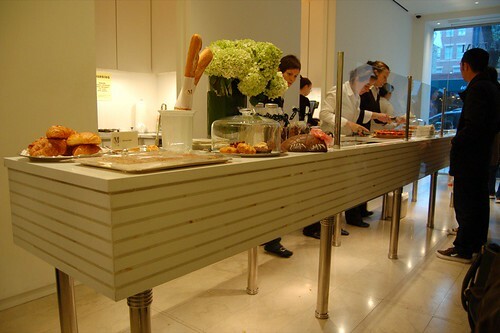 I secured reservations at Sushi Yasuda, which I had been wanting to try for months. That Friday, a few of us headed down to the city after our section ended and left Ithaca around 2; I was confident that I'd be able to make it to the restaurant by 7. We make good time for the first 3.5 hours (with my "liberal" driving), but as we neared the city, we ended up missing both the GW Bridge and Holland Tunnel exits. Upon reaching the toll for Lincoln Tunnel, we find a second chance to get on the GW. After we get off the bridge, we are hit with heavy traffic trying to head midtown. Knowing that my reservation was slipping from my hands, I drive like a bona fide cab driver, weaving in and out and causing many an outcry from my passengers. I finally make it to Yasuda at 7:30, and our party is denied our table because I was late. Brilliant. Disgruntled, disoriented from driving, and quite dilirious, I decided that life goes on. But I was still hungry for sushi, so we decided on Hatsuhana, which has a reputation for being good, consistent, and reliable. I can't say their sushi is the best I ever had, but it was decent. The amaebi and uni are great, but the toro was hard, chewy, and tough. 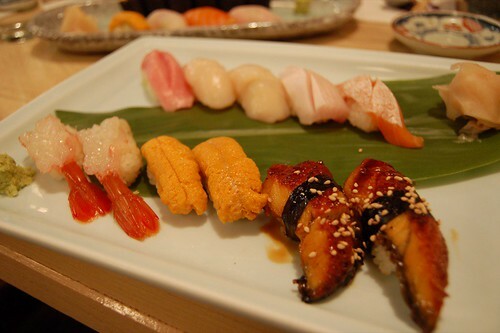 I foresee a sushi pilgrimage (Yasuda, Megu, Gari) in the near future. Needless to say, it's a noble cause, too. 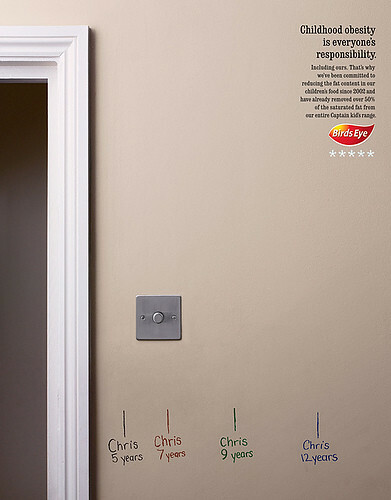 Hopefully, no parents really resort to this (rudimentary) way to keep track of their children's "progress"! They could always enroll their children in organized sports, though such a measure may not be so effective with the dawn of organized snacks.